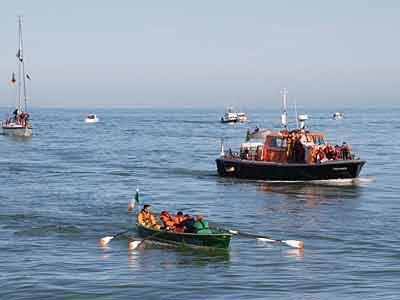 The Celtic Challenge is a gruelling overnight race for Celtic and Pembrokeshire Longboats across the Irish Sea from Arklow to Aberystwyth, billed as the longest true rowing race in the world at 90 nautical miles. The results of this year's race on 3rd May are just out - Arklow Ladies were first across the line, but the overall winners were Arklow Men in a time of 17 hours 37 minutes 45 seconds. Conditions were so rough six boats had to retire. Longboats are about 24ft long, with four oars and a cox, and have been getting very popular lately. The picture of the Arklow Men boat is from BBC Wales - there is an excellent slideshow here.